How to Restore Files from Windows 7 Backup to Windows 8/8.1 Computer? 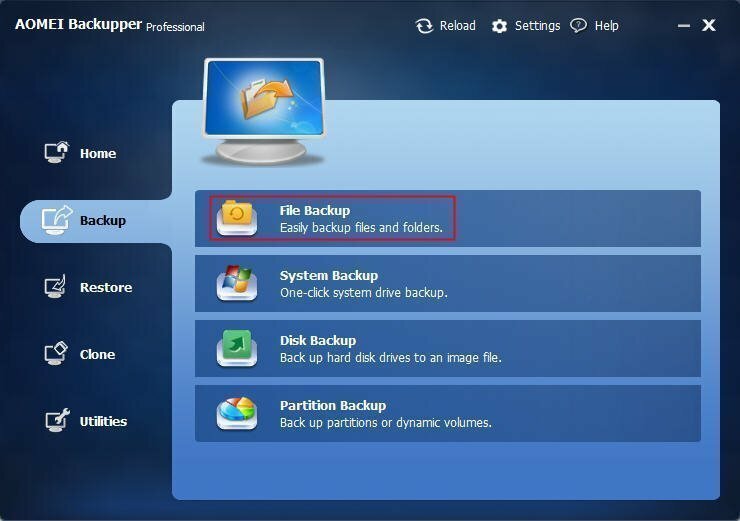 Read this article and find the best way to solve the problem of how to restore files form Windows 7 backup to a computer installed Windows 8 or Windows 8.1. As is often the case that you would like to backup important files in one computer and restore them in another computer. But what if the first computer system is Windows 7 and the second computer is Windows 8/8.1? In fact, this is not as difficult as you have thought. Generally, there are two ways to reach this goal. The first method is by copying and pasting, and the second one: through backup software. Now we will introduce these two methods one by one. Copying and pasting is the most commonly used way in file backup and restore. Combining with the theme of this article, it means that you copy and pasting the files in Windows 7 computer into an external hard drive, and then insert that external hard drive into Windows 8/8.1 computer, at last transfer those files to the second computer. Pros: this is a very direct way and almost need no cost if you already have an external hard drive. Cons: it may seem a little bit dull and may require a large-capacity hard drive. In accordance with the above questions, there is another flexible way - through backup software. You must have had a basic knowledge of some famous backup software such AOMEI Backupper. AOMEI Backupper Professional is specially designed to offers backup and restoration services with its easy-to-use applications. It helps you create backups for files, folders, disk and partitions, and then restore data when needed. Backupper supports Windows XP/Vista/7/8/8.1, both 32 bit and 64 bit. 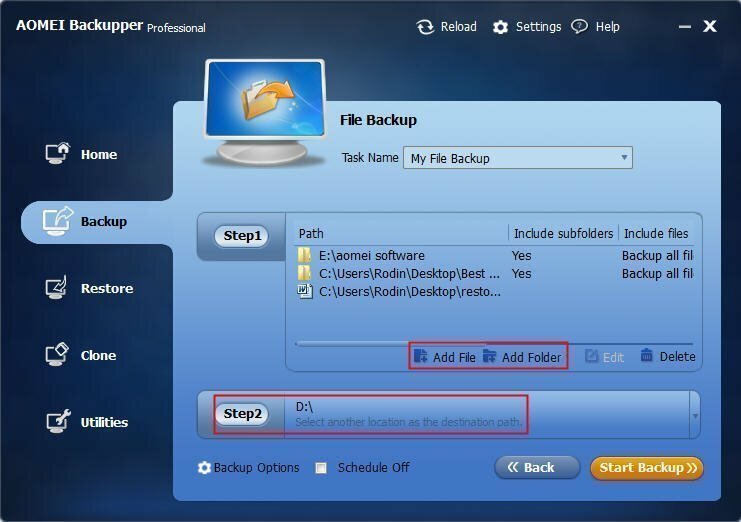 And next we are going to talk about how to take advantage of AOMEI Backupper Professional to restore files from Windows 7 backup to Windows 8/8.1. Step 1: Prepare an external hard drive and insert it in Windows 7 computer. Download AOMEI Backupper Professional, install and run it. You can see that the main functions are listed at the left part. Now click Backup and choose File Backup. Step 2: Then you are expected to select the files/folders you cherish and the destination path you’d like to place these document in. Note in Step2, you should click and select the external hard drive as the destination path. Now you can click Start Backup. Step 3: When this backup is finished, remove the external hard drive, and insert it into that Windows 8 computer. Also, download, install and launch AOMEI Backupper Professional, click the Restore column. Browse a path to select an image file and restore data from the file. You should find the file image in that external hard drive. Step 4: In case that you have made several file images, AOMEI Backupper will ask you to select a backup time point to restore. Click Next to continue. Step 5: Then select the files or folders that you want to restore. Step 6: Now select a destination path to restore. Since you are going to restore the file image to a different computer, you should choose Restore to a new location. Finally, click Start Restore and wait for the success. Pros: this is a relatively better way for file backup and restore in case of a large amount of data, because the original files will be compressed so there is no need for you to prepare a large-capacity hard drive. What’s more, it takes fewer time compared with copying & pasting. If you happen to put your entire important files in a single partition, then you can choose Partition Backup & Restore instead of File Backup & Restore, which is more convenient than pick up scattered files one by one. Cons:To average users, this method may seem a little complicated. In fact, it is not. Above is not the whole story. If you have a NAS (Network Attached Storage) device, you can use it to replace the external hard drive. Check this article for reference:"Windows Server 2003 Backup to NAS – AOMEI Backupper Server". And the restore process is similar with using external hard drive.